Our annual Centre Luna Yoga Spring yoga retreat has come to an end, and now that I’m back home, languishing in the drizzle of cold rain and misty fog (beach? did someone say beach? 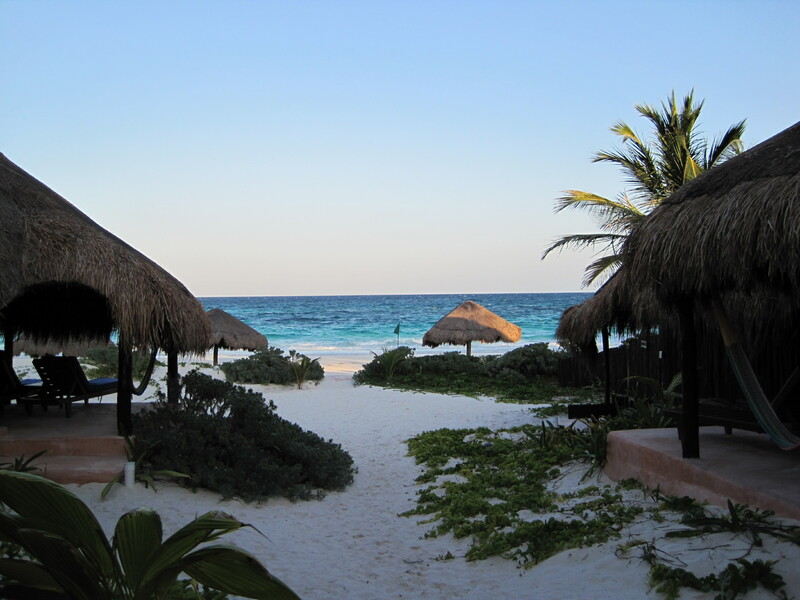 ), I thought I’d share one of the most interesting insights I brought back with me from our time in gorgeous Tulum, Mexico. I remember from my past career what inevitably happened every time I found myself on vacation or with time off – my body would somehow break down, usually to lesser degrees than are insinuated with that expression…a cold here, a flu there, etc…My trip to Tulum started off with a similar, albeit shorter, physical reaction: I passed a kidney stone within 2 hours of landing. The first inkling of trouble was detected as we made our way to the retreat centre in our shuttle bus. The pain was new to me, the worries of possibly having to spend time in a hospital stressful (to say the least), but once we got to Retiro Maya, it all resolved itself. I suppose I may be responsible for setting the tone for the other retreat members, because as the week progressed, some of the participants went through other physical tests including gall stones, an outbreak of eczema, an eye infection, and a plethora of mild digestive issues. My reaction to the kidney issue, the gradual onset of fear and worry, seemed to jump from person to person as each situation arose, and as it travelled onwards, I could stand back and objectively examine exactly what was going on. I spoke to my class on the retreat about Patanjali’s Yoga Sutras, and one evening I highlighted Sutras 7 & 8 from Book Two, the Portion on Practice that discusses attachment and aversion. Attachment is most commonly defined as identification to those experiences that we deem as being pleasurable, and aversion as identification to those experiences that we deem as being painful. The second each of us who felt our physical bodies offering up something less than ideal became aware of whatever “problem” we were dealt, the aversion kicked in…the irritation, the worry, the fear…all by-products of the greater fear, that of death. Our own mortality was offered up to us in the guise of our ailments, and as opposed to the concern we each felt in the moment, I have walked away from the experience with a deeper understanding of myself and ourselves as a collective unit. That fear of death is the underlying fear of all fears, the instinctive desire to grasp onto life and never let go, our survival mechanism. It is exactly that fear of death that is now under examination in my life. I believe that once this fear is delved into and deconstructed, it will have less of a hold on me and my life will be freer to have a clearer outlook on that which is temporary and fluctuating, regardless of how it may affect me on a physical plane. With all that in mind, I once again found myself deep in the Sutras, a reference that has never failed me yet. Lo and behold, I found what I was seeking, the source of my information embodied in Book 2, Sutra 9 – Clinging to life, flowing by its own potency (due to past experiences), exists even in the wise. The interpretation of this Sutra (by Sri Swami Satchidananda) is excerpted as follows: Many Westerners don’t believe in reincarnation. They feel, “It’s all over when we die.” But the Yoga philosophy reminds us that all our knowledge comes through experience. Without experience we cannot understand or learn anything. Even books can only remind us of something we have experienced in the past. They help kindle a fire that is already in us. That fire must be there first for the kindling stick to kindle it. ..Yoga says instinct is a trace of an old experience that has been repeated many times and the impressions have sunk down to the bottom of the mental lake. Although they go down, they aren’t completely erased. Don’t think you ever forget anything. All experiences are stored in the chittam; and when the proper atmosphere is created, they come to the surface again. When we do something several times it forms a habit. Continue with that habit for a long time, and it becomes our character. Continue with that character and eventually, perhaps in another life, it comes up as instinct…In the same way, all of our instincts were once experiences. That’s why the fear of death exists. We have died hundreds and thousands of times. We know well the pang of death. And so, the moment we get into a body, we love it so much that we are afraid to leave it and go forward because we have a sentimental attachment to it…if your old body is taken away…you must get a new one. Many people do not know this and cling to the body even when it gets old and dilapidated. That constant clinging, breaking away, clinging again, breaking away is why we are mortally afraid of death. Need I say more on the subject? Despite the aforementioned tests, our retreat was a full week of joy, light, love, and bonding. A literal re-connection to the earth and all its elements was experienced by each and every one of us…the stars and planets close enough to touch, the ever present, constant roaring of the ocean, the mighty gusts of wind, the almost-magnetic energy of the Mayan ruins and all the surrounding land, and the non-stop laughter we were privy to made this retreat a series of perfect moments, a true reminder of everything we are blessed with in this life. And so I emerge from this retreat with a deeper insight into life, hungrier than ever to continue learning and being able to share whatever I come across…all bringing me back to where I began, back to the source.